For the smell of charcoal on a dull fall day. For chestnuts, too, and the dry leaves of Bayard St. Bright with the yellow breast. For babies, for kittens, for little humble things. To walk in parks, over bridges, or just among the people. The sky is ours, the wind, the rain. There is sun on bare branches, and sun on the housetops. Real change comes about when we take the heart of God to a needy world. DOROTHY not only transformed her heart by the living presence of Jesus in her life, but she also carried that love to others and shared it with with those in need ….whether for food for the body or the soul. 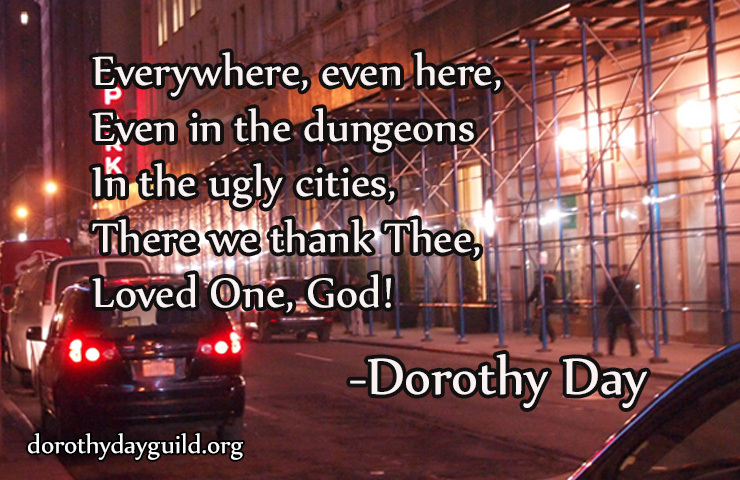 We must pray for more Dorothys in this world…..let it begin with us!